Where's the crust? We skipped it. 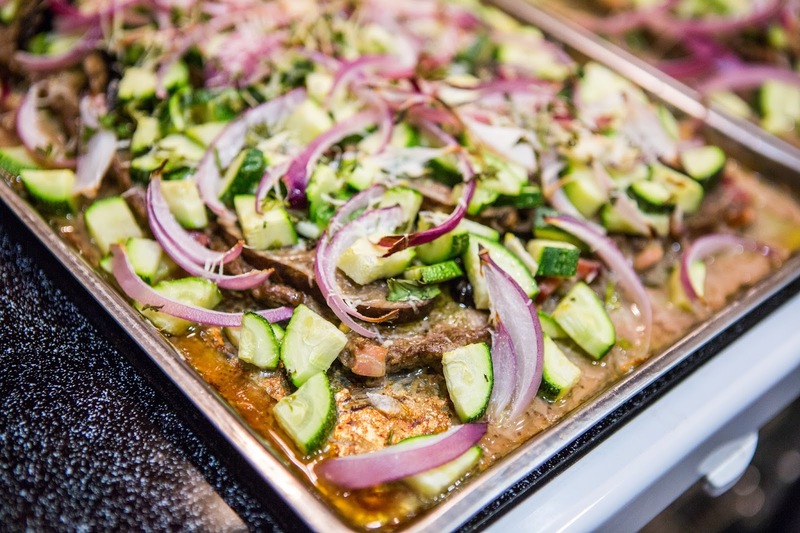 Yep, no empty carbs here- instead it's made on a crust made of grassfed beef. Think meatloaf + toppings. It's a crazy idea, and it's crazy delicious. Pizza is an iconic food- it smells amazing when it's freshly baked, and is a comfort food for many of us. It's also one of the first things to go when you decide to go gluten free, dairy free and processed food free. Against The Grain makes a pretty delicious frozen pizza (available at Publix), and Udi's has one that's quite good also. Meatza is our keto/ paleo/ gf answer to baking pizza. Instead of a grain crust base, you'll build a beautiful tower of veggie toppings on more of a meatloaf base using grassfed ground beef. It puts traditional meatlovers pizza's to shame, and has a strange way of disappearing off the pan before you can wink an eye. At least in our kitchen! 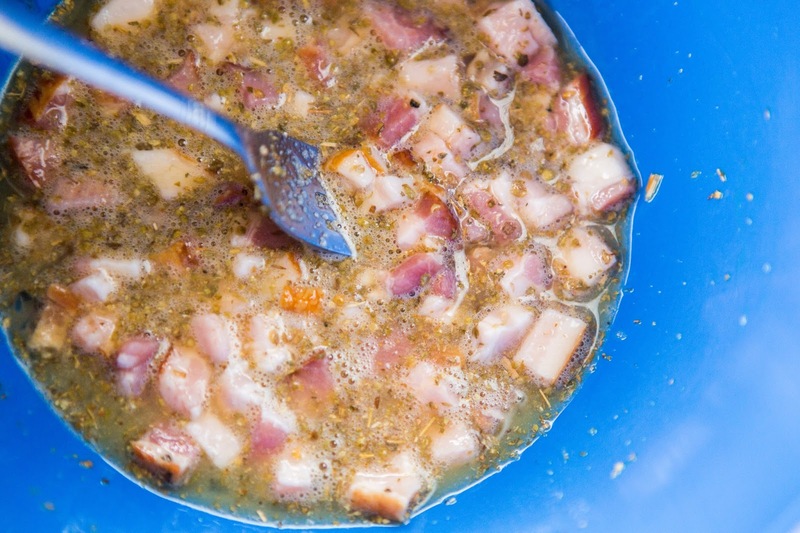 Fun flavor options: diced bacon (organic, hormone free! ), garlic, green onions, onions, oregano, spices- just probably not all at once. 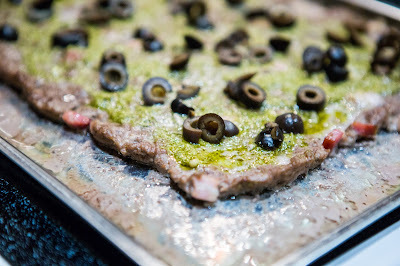 How we make Meatza- feel free to experiment! Remove, serve and enjoy sharing the gooey, crumbly Meatza goodness! Here are some photos of the process- it's a pretty simple, fast way to cook a lot of good food. Cook two and you'll have leftovers for work lunches. Mix up the eggs first with the chopped bacon, before you add the meat in so the eggs disperse well. 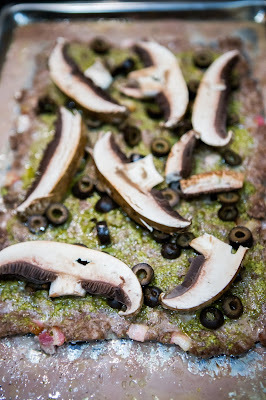 Spreading pesto + olives on our pre-baked grassfed beef and bacon meatza "crust"
We added some yummy portabellas to this meatza, but it's not done yet..
We've added red onions, chopped zucchini, yellow squash, portabellas, olives and a pesto base to our Meatza grass-fed beef crustless pizza. 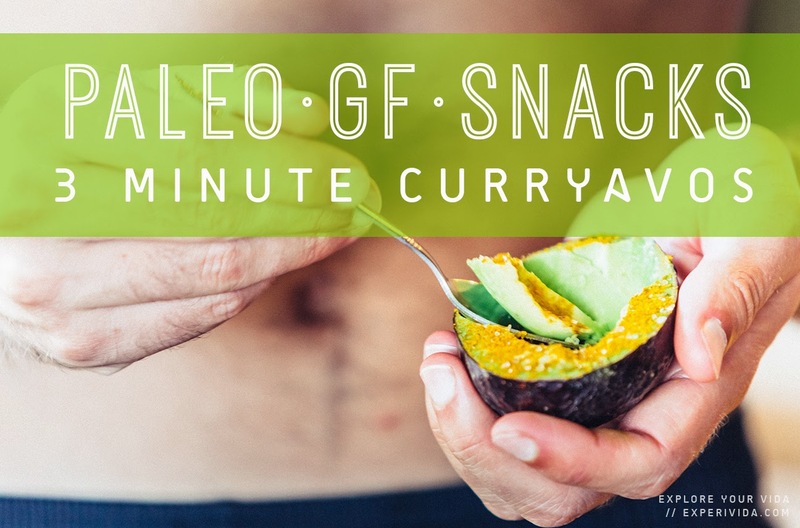 "paleo cooking" "paleo food ideas" "Paleo recipe"
Have you heard of curryavos yet? Probably not because we just kind of invented them as a way to spice up one of our favorite paleo snacks- avocados. These tasty fruits (yep- avocados are technically a fruit!) not only taste amazing, but we also love that they are gluten free, sugar free, dairy free.. and a highly recommended food from folks like Dr. Cate Shanahan. In fact, it's part of the 4th pillar of Dr. Shanahan's four pillars of nutrition: Fresh, Uncooked Ingredients. Avocados are packing some pretty rocking nutritional power. 1- Avocados contain fat. 77% of it is fat, in fact. We all used to think fat was bad, but science has proven otherwise- and it turns out that some fats are actually nutritional superstars. Avos have oleic acid in them- a monounsaturated fatty acid that is proven to keep your heart healthy. 2- The fat in avocados will help you absorb fat soluble nutrients better. Which means you'll get more antioxidants and vitamins out of the salad & other organic veggies you pair with it. Yes, please! 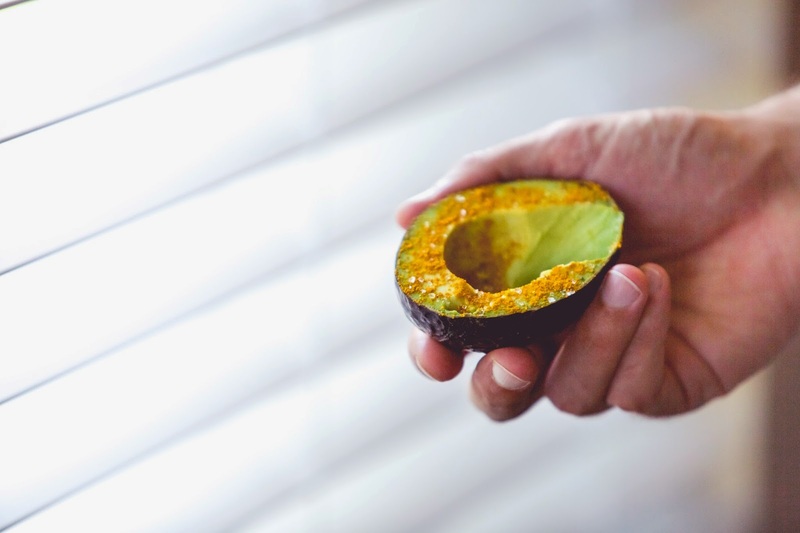 3- Avocados have been linked to fighting cancer, helping our eyes (they contain eye loving compounds Lutein and Zeaxanthin), and reduce the symptoms of osteoarthritis. 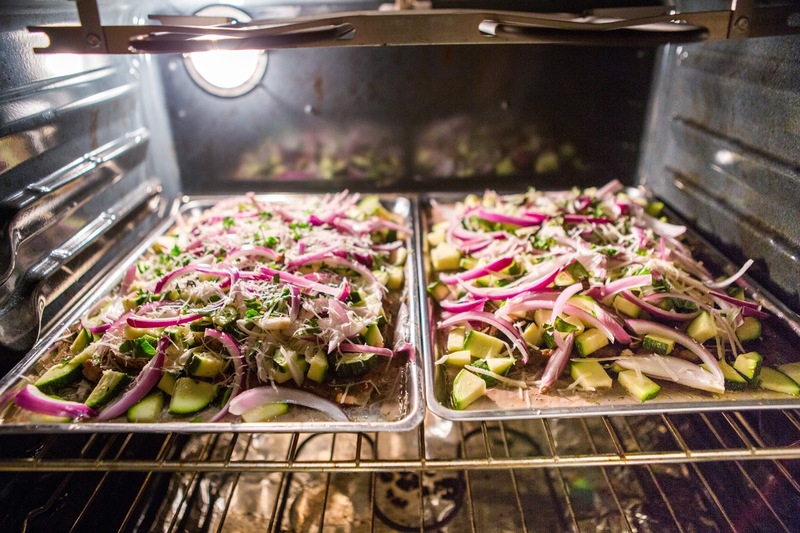 Recipe preparation time & type: 3-5minutes - Super quick paleo morning or afternoon snack, or pack it for lunch. 1. Cut a ripe organic avocado in half. I recommend Hass avocados for their flavor! 2. Spice it up, and get creative: Add little sprinkles of fun organic spices: curry powder, cumin, basil, cilantro, turmeric- feel free to experiment! 3. Optional: Add a dash sea salt & pepper to flavor. If you work out and sweat a lot, it's great to replenish salts- within moderation of course! **Paleo Protein pairing: Avocados go great with canned red salmon, soft boiled eggs, diced or sliced bacon, and grass fed beef! What's in a Name? | Help us with our Farm Share business idea! Our project isn't so much to make an app/website as it is to create a way to connect people, as many of the best businesses do. Currently there's a huge disconnect between local farmers and the consumers that want their produce, which we believe is one of the biggest limiting factors preventing further growth of small farms. 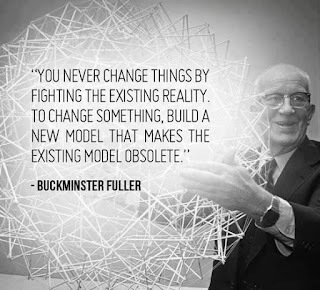 Right now we're seeing a resurgence of small local farms, backyard gardens, and DIY chicken coops; the challenge is to efficiently utilize these resources and get any surplus produce to consumers before they spoil. We're envisioning an Airbnb level app and/or web platform, with farmers instead of hosts and produce instead of rooms. 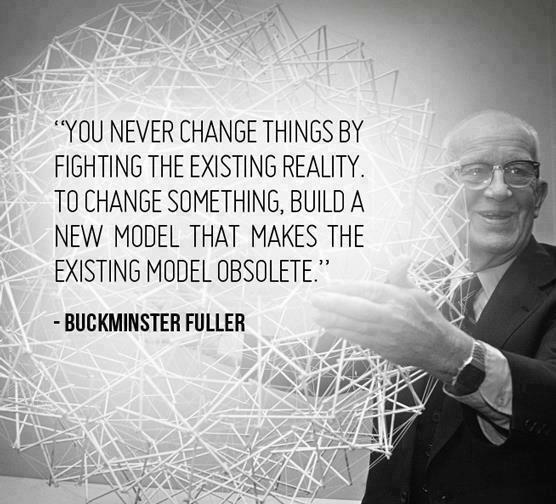 Let's help to bring the localvore movement to the 21st century! Want more Experivida? Enter your email address and Subscribe! Expereview Week #5 || Compression Fails! Or does it? Can you tell the difference between these 3 audio tracks? Today we're diving into a bit of a different topic than usual, audio quality. Audio quality affects all of us every day, whether good or bad, and with the increased proliferation of steaming services (Pandora, Spotify, Podcasts, etc.) the type and amount of compression used will continue to be an important consideration. I've read articles on this subject before, but NPR has put together one of the best side by side compilations I've ever seen/heard. So, sit back and relax in front of your best sound system (or ear buds) and let me know what you think in the comments. Personally, I got as many wrong as I got right, haha. Feliz cinco de mayo, from the photographer's garden! 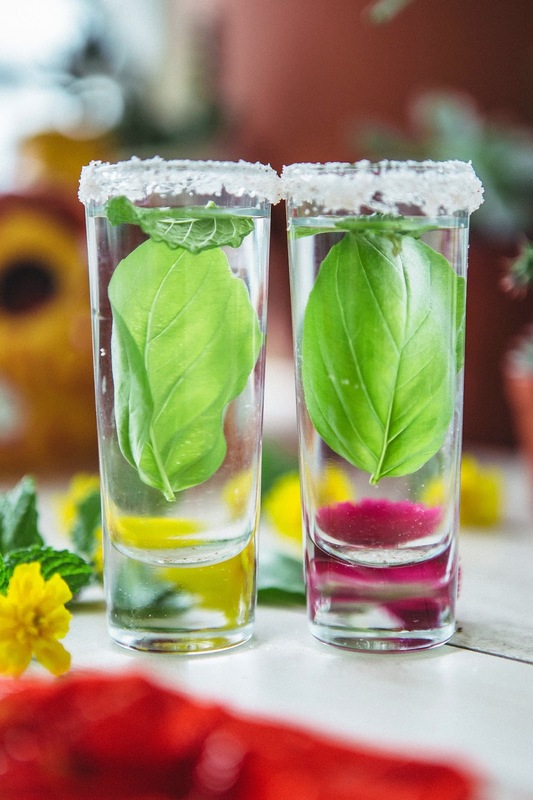 Spice up your favorite tequila with some fresh picked herbal flavors like basil & mint! Finish it off with himalayan rock salt. We don't drink often, but when we do it's great to enjoy something fresh, organic and (relatively) low sugar. Traditionally celebrated in Mexico and by Mexican Americans, Cinco de Mayo is not actually the Mexican Independence day as many people believe, but instead commemorates a landmark military victory by the underdog Mexican army over French forces at the Battle of Puebla on May 5th, 1862. How to make: Dip the rim of your shot glasses in rock salt- we used Real Salt Himalayan Pink, then add your freshly picked Basil and Mint leaves. 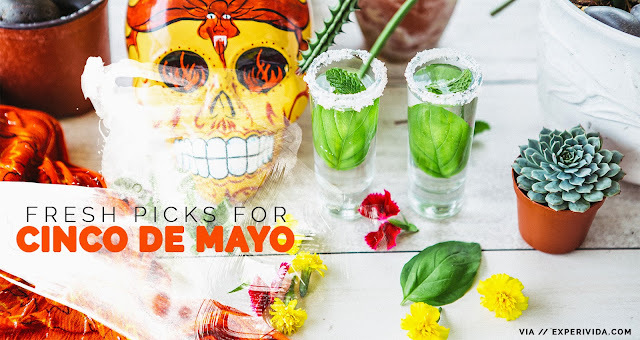 Pour in 2 shots of your favorite tequila and cheers! 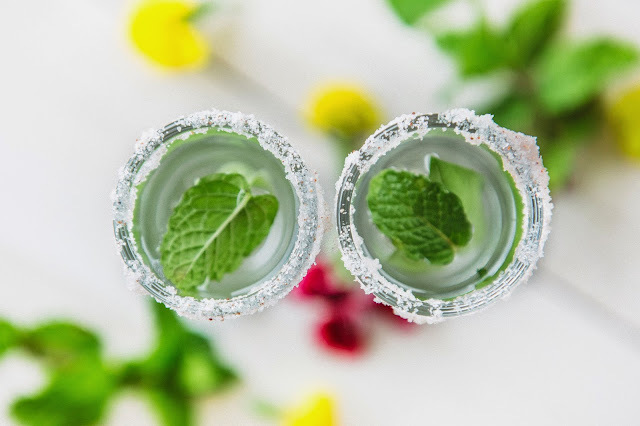 How to make: Mix Tequila, basil, mint, lemon or lime juice with ice, then add on top of the soda water in a Tom Collins glass! 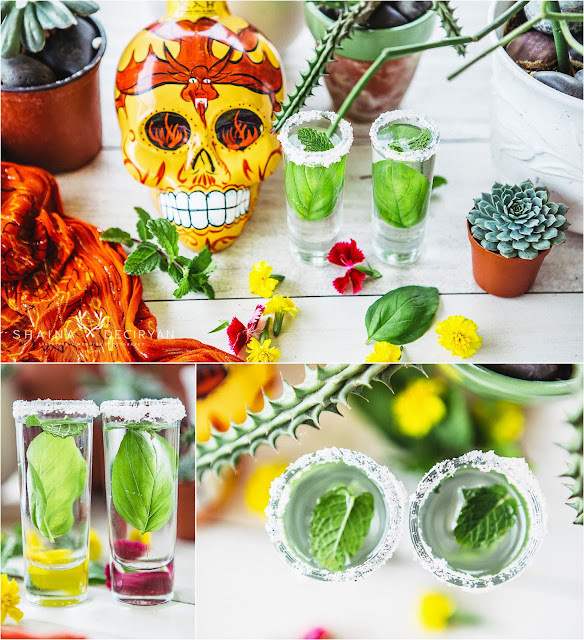 Add a basil leaf or lime garnish and enjoy! 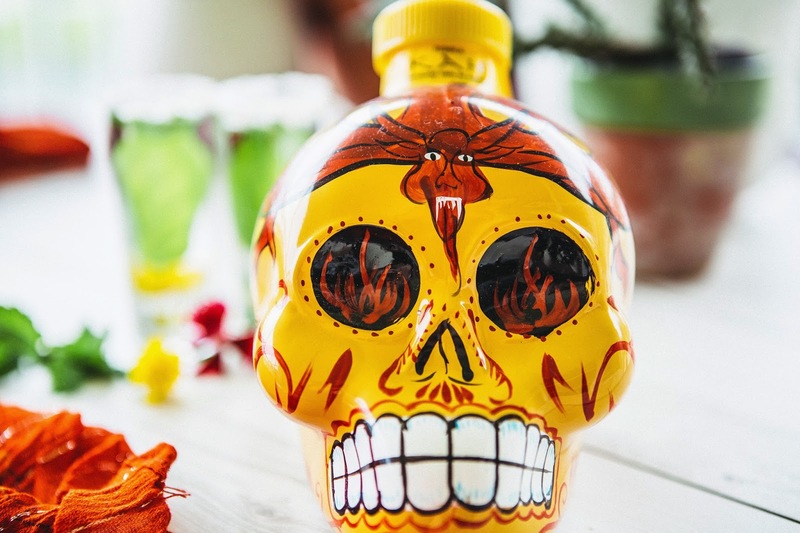 If you're interested in checking out this great Dia de Los Muertos inspired aged Tequila by Kah, check out Tequila.net's full review of Kah Tequila Reposado (110 Proof). This tequila has a great full bodied taste, and is made with a highly traditional method by true Tequila craftsman. Feliz Cinco de Mayo, from the Experivida team! Amanda Ravenhill is graduate of Presidio's Sustainable Business program, a TEDx Japan presenter, a burning man aficionado, co-author to the upcoming book Drawdown with Paul Hawken, an Americorp Fellow, head of business partnerships at 350.org co-founder of The Hero Hatchery, with her husband Ryan Kushner, and she spends her summer's teaching kids on her native Maine island traditional boatbuilding skills. She's one of those larger than life human beings, who is pouring her heart into creating a better world. I know this because she happens to be my cousin. I've been proudly watching her journey to becoming the courageous advocate for the environment that she is. She has recently been interviewed by Entheos on her work as part of their "The Future is Calling us to Greatness" campaign. I have no idea how it feels to have so many familiar faces and places ripped out from your life. Many folks in Nepal have experienced just this lately with the powerful earthquakes that hit in April 2015 that I'm sure you've heard about. 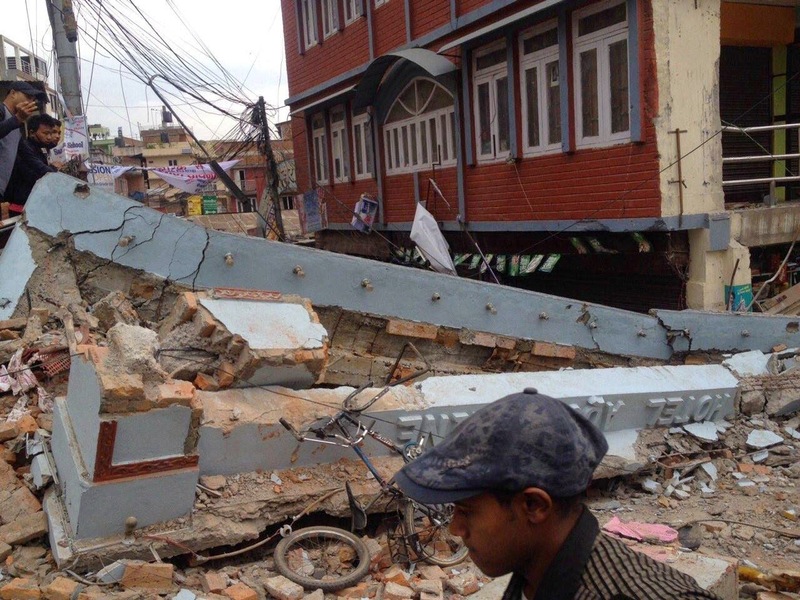 The BBC released estimates of over 3,000 lives lost in the regions of Pokhara and Kathmandu. I've only visited Nepal on the pages of National Geographics and their amazing photo essays, but I'm sure that a disaster of this scale would be hard on any community- let alone one with as little infrastructure as Nepal for rebuilding and moving on with life. Especially for the little ones! Let's Celebrate Earth Day this year by appreciating our ENTIRE ecosystem; the animals, plants and natural environment in which we all live together! No one piece can survive without the others, we thrive or perish together on this tiny blue spec in the vastness of the universe. Allan Savory's story is tragic, following traditional wisdom and doing what he thought was right resulted in the deaths of 40,000 elephants... all in the name of saving the Earth. He could have just ended his career there, devastated by the failure, but he didn't stop. Instead, he has dedicated his life to re-educating the public on the symbiotic relationship between plants and animals. Allan Savory says it best, watch his TED talk below and Happy Earth Day! 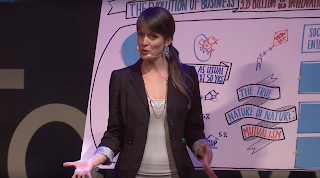 Sharing stories from their adventures from their road to health & happiness. Shaina DeCiryan is an Orlando Wedding Photographer and business owner, and Joshua Titus is a mechanical engineer in the Space Coast region. THRIVE Market - Where Healthy Eating and Living Thrive! Copyright Experivida 2016. Powered by Blogger.